The Chicago aviation officers who forcibly removed a passenger from a United Airlines flight filed reports saying the traveler was “aggressive” when responding to requests to give up his seat and flailed his arms while fighting with officers. The reports, released Monday in response to Freedom of Information Act requests by the Los Angeles Times and others, contradict videos of the incident caught by fellow passengers on their cellphones and viewed by millions of people worldwide. 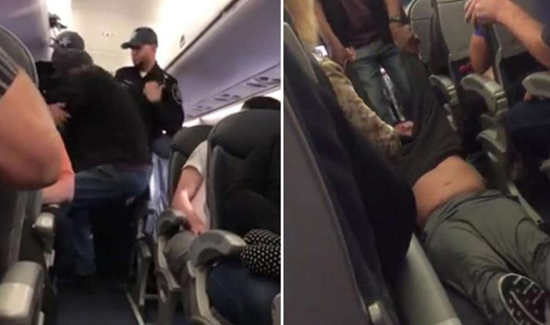 Those videos show the passenger, Kentucky physician David Dao, refusing to give up his spot on a full flight, then being yanked from the seat by the officers, hitting his head against another seat and being dragged down the airplane’s aisle. The ensuing public outrage prompted United Airlines to issue several apologies and launch a review of its procedures when dealing with sold-out flights. Chief Executive Oscar Munoz has promised that airline employees won’t call on law enforcement to remove passengers in the future if the incidents don’t involve safety or security. The incident reports also reveal for the first time the names of the four officers involved in the incident, which left Dao, 69, with a concussion and other injuries. All four of those officers have been placed on administrative leave by the Chicago Department of Aviation, city records say. The officers were identified as James Long, Mauricio Rodriguez Jr., Steven Smith and Sgt. John Moore. Two of the officers had previously been disciplined for workplace violations, according to city records.